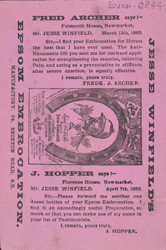 This is a leaflet for Epsom Embrocation, a medicine for horses. In the 19th century, horses were used by the working classes to pull carts on farms and cabs and carriages in the streets of the cities. Great care was taken to ensure that the horses were healthy as the loss of a horse would mean the loss of livelihood and this would have left families destitute. Wealthier members of society raced horses; professional horse racing started during the reign of Queen Anne (1702- 1714), when match racing gave way to professional races involving several horses and spectators wagering money.